Having lived all my life in the hills, I know how my skin reacts to the sun. I have very sensitive skin so I need to take extra care. If you have sensitive skin like me, do not I repeat do notttttt move out without a good sunblock. Overexposure to ultraviolet rays gives sunburn which can further lead to lot of skin problems. One very important thing to remember is that you need to use sunscreen after every few hours. We all think we used it once in the morning and now we don’t need it. But ladies you got to re apply sunscreen after few hours. Last Saturday was one such day for me. I used sunblock in the morning and went for my work. After few hours I moved out and got really bad sunburn. No matter how sun-experienced you are, burns can still happen. By evening my face was red and it was itching badly. And I was like, ohhh noooo not again. Because I always get sunburn, like always. Even if I take X amount of precaution. This time I discovered a miracle product which did wonders for me. For first two days I was using aloe vera gel and ice. But my skin was becoming very flaky and I could scars all over my face. It was like a nightmare. I felt like locking myself up in one room and not moving out. It was that bad. I used Coconut Oil on my skin, which worked like a miracle product for me. 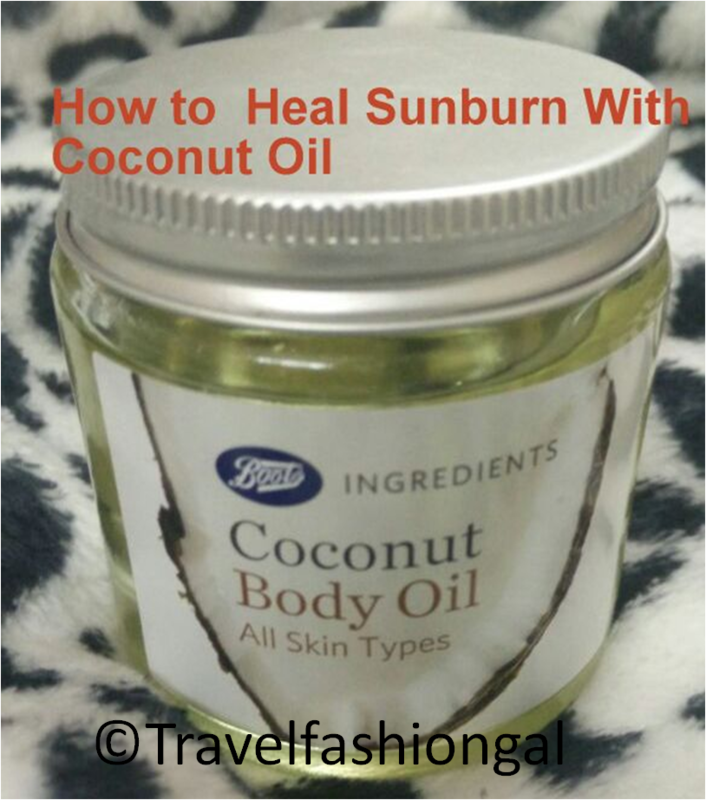 I knew coconut oil is good for skin, but never realised it can heal sunburn. I could see the difference overnight. My skin was feeling better and I could see less scars. It just felt awesome. Waking up to a good skin after dreadful burns just makes you feel so better. But remember there is no cure for burns; it takes its own sweet little time to heal. I used Boots Coconut Body Oil. I will call it a miracle product. 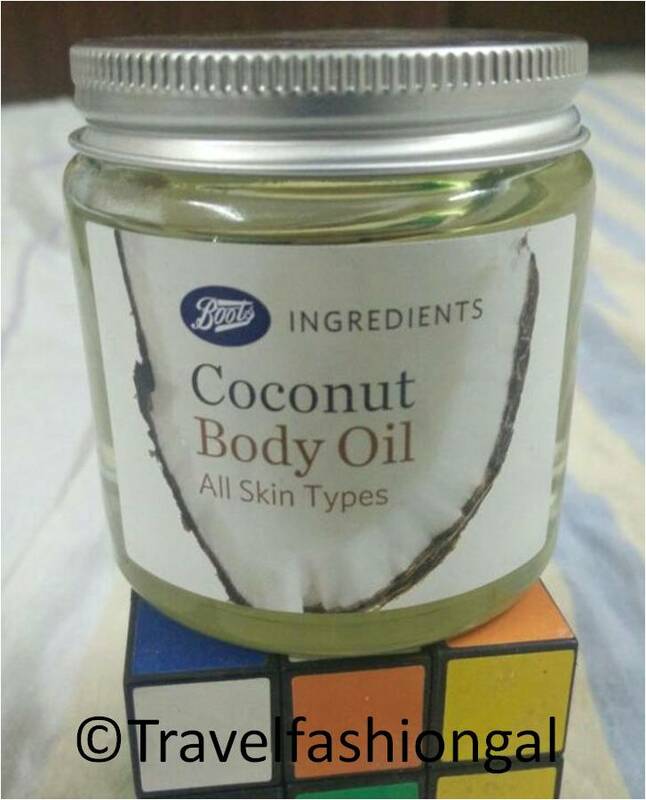 You can use any coconut oil which is available. This oil quickly soothed the burning. There are several benefits of coconut oil. One can use coconut oil for hair care, maintaining cholesterol level, weight loss, heart diseases, diabetes, etc. Coconut oil is very light, it quickly absorbs in the skin. Use lots and lots of ice when you get sunburn. Don’t use the ice directly on the affected area. The idea is to gently cool the skin. For inflamed skin use wet towel or take ice and cover it with soft linen cloth and apply on your skin. Take few drops of coconut oil and gently dab on your sunburned skin. Do this process every night before sleeping. You do not have to remove the oil, it will get absorbed in your skin. You a towel or any cloth to cover your pillow. The oil can stain your pillow which you will not like. A word of precaution for all you lovely people. Do not use coconut oil immediately after the sun burn. When you get sunburn always wash your face or body with cold water. Use coconut oil only after a day else it will trap the heat inside your skin. There are lot of home remedies for sunburn. But this is what I tried and got healed with. Now when I move out in the sun I carry umbrella, hat or something to cover my face from the direct heat. Leave in the comments below if you have any more suggestions or anything that you would like to tell me. I would love to hear from you.